The great teams all play with force, and last Thursday night the Bulldogs signalled that they’re going to be a great team, if they’re not already. One of the beauties of sport is that avenues to victory are as diverse as they are winding. Some teams win in spite of themselves, other teams are handed gifts. You can win with finesse or brawn, or combine the two like Hawthorn tend to in their grand finals. In Perth, the Bulldogs had the most classical and most beautiful of victories – they imposed their collective will on the game and made the unilateral decision that they just weren’t going to lose. It’s hard to recall a more impressive finals victory in the past few years or beyond that, the past decade, although the Giants made their own case less than 48 hours later. Hawthorn’s 2014 grand final was breathtaking, but their brilliance was almost blighted by how inept their opponents were – it was a first round knockout and barely a fight. Fremantle toppling Geelong at Simonds Stadium in 2013 comes to mind too. That was a win that more closely followed the archetypical underdog route to victory. The Dockers stuck around, leveraging their one clear advantage – 53 hitouts to 16 – all day long and then punished their opponent’s profligacy (9.18) with a late flurry. The Bulldogs’ win in Perth did not follow such a path. The Dogs didn’t stick around and sneak to victory – they carried out a funeral and smashed in the coffin with a sledgehammer until there was nothing left. I can’t remember a game where the story of an upset victory had so little to do with the beaten favourite. The Eagles were powerless on Thursday night, bystanders to their own annihilation. They showed up, and they didn’t wilt so much as they were put on their knees. It seems impossible to say that a 16-win team that just lost a home final by eight goals and went home home before the first weekend of finals even properly kicked off has nothing to be ashamed of, but I’m not sure the Eagles can lament their elimination final too wistfully. This wasn’t last year’s grand final, a loud, magnificent disgrace where they never gave themselves a shot. West Coast competed against the Dogs, they just weren’t allowed to be competitive. Nothing about the game made sense. The script was burned the moment the ball was bounced. The Dogs looked their age early on, the first two goals of the game gifted to the Eagles by errant, hesitant Bulldog kicks looking to exit defensive 50. But they regrouped like they have all year long, and what followed was as shocking as it was marvellous. The Dogs turned convention on its head. There are certain things you can’t do in football in 2016, like take a mark in your back 50, see that movement is stagnant ahead, and then just kick it to an even contest in the centre square. But the Dogs did that, and they were rewarded for their endeavour time and time again. They executed those kicks, which were rarely marked, like they just knew that when the ball hit the ground they were going to be harder and faster and cleaner than the Eagles and win it almost every time. And they did. There was no singular transcendent performance or tactical masterstroke that won that game. There was no Aaron Sandilands monstering Nathan Vardy over and over. Marcus Bontempelli and Jake Stringer, the team’s two most dynamic players, were virtually unsighted with the game in the balance. 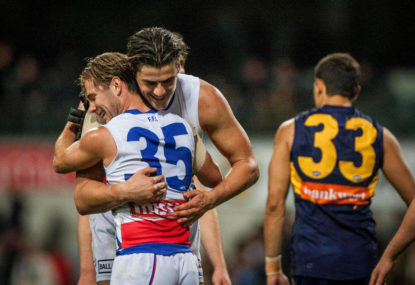 The team prospered as a team, It was the silky delivery and opportunism of Caleb Daniel and Luke Dahlhaus, the hardness and perfectly weighted handballs out into space of Tom Liberatore, the dash of Jason Johannisen, the clinical finishing of Tory Dickson, and, as everyone predicted, the contested marking inside 50 from Liam Picken. A lot has happened in football since last Thursday. The Hawks and Cats played out another classic, in a rivalry so magnificent it makes you wonder if some sort of wonderful cosmic determinism has to be driving it at this stage. If it is, so be it – to hell with free will. The Kangaroos completed their exit stage right, something they’ve been signalling their intent to do for the better part of three months. The Crows escaped unscathed, and the Swans weren’t nearly so lucky. And then GWS showed us that the football apocalypse may indeed be ahead of schedule. But still, Thursday night lingers, and with it the thought that another giant might have been born outside of New South Wales.